“We need to have colleagues and collaborators thinking about issues outside our borders,” he said. He wants to work with Americans, and since the American theater is not going to come to Soulpepper, Soulpepper is going to it. The company will place itself in New York long enough, and offer a wide enough selection of its work, to give audiences and theater professionals a sense of what it does. Mr. Schultz hopes to foster discussion, both formal and informal, with fellow artists. Ideally, new relationships will follow with theater makers he already knows by name and reputation who don’t yet know him or his company. July is meant to be an introduction. I offered to help give them publicity - I suggested they might want me to run an offer on the weekly NYCPlaywrights email blast (every Saturday at 5PM) for a voucher for a pair of free tickets to see the show(s) - which they took me up on. I gave the voucher away within 30 minutes of the weekly email going out. 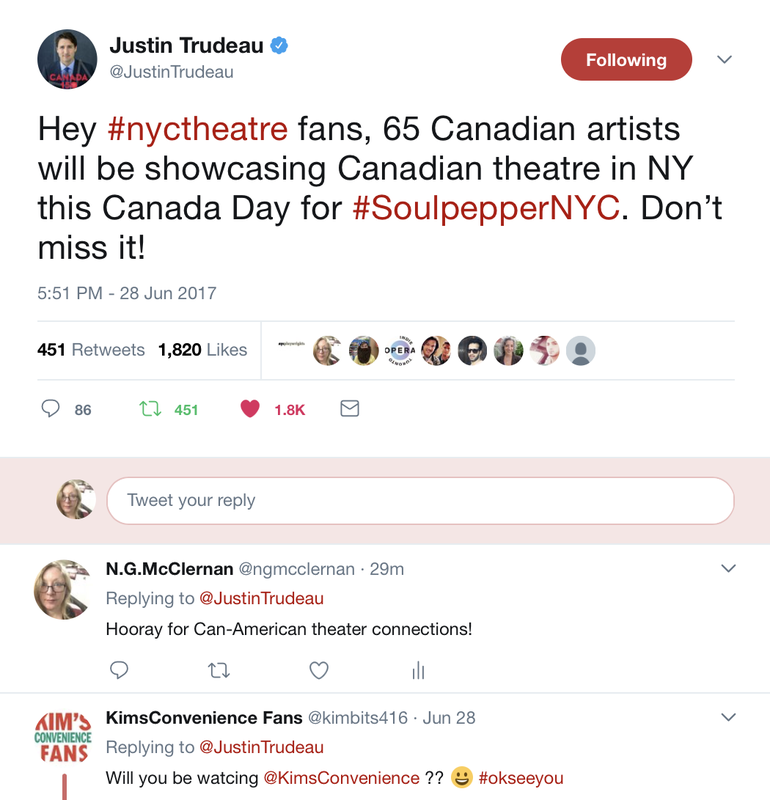 Then I discovered by way of this article that Justin Trudeau, the man himself, had tweeted about SoulPepper. Wow. Shows you how tiny Canadian society is that the Prime Minister would tweet about a theater company performing shows in the US. 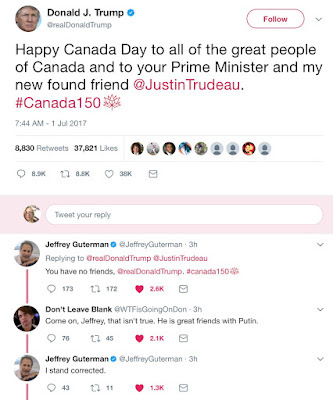 The only way you'd catch Donald Trump tweeting about an American theater company in Canada would be to attack them for the audience's reaction to a member of his administration, or for their portrayal of Julius Caesar or to insult the physical appearance of one of the female cast members. 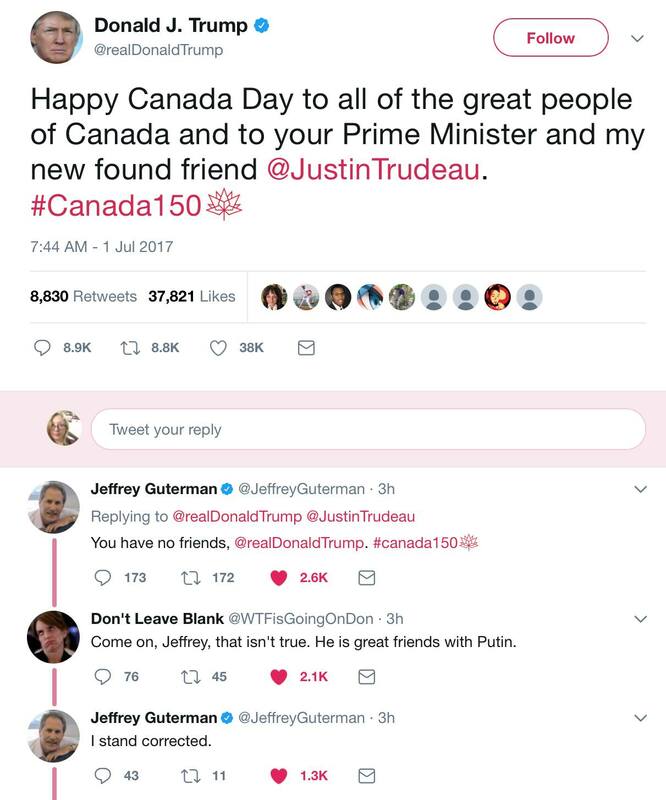 Meanwhile Trudeau is playing Trump hard.